Jason and the Haymakers plan to get a little rough and rowdy with friends at Joe’s Bar Friday night – in a good way. 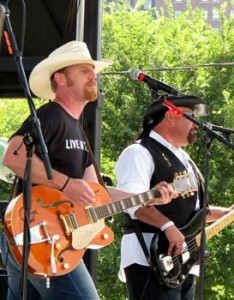 The American country band will play a slew of originals as they open for James Otto at 8:30 p.m. The band plays their own brand of rowdy country to beer drinking, good people they call fans. “Somebody who hasn’t seen us is usually in for a bit of a surprise,” said Jason Bertrand, lead singer. Although the band has segued out of the bar scene a bit as they opened for acts like Montgomery Gentry and Pat Green on various dates this year, they look forward to returning to Joe’s. “It’s fun to get back in an intimate setting and be close to people,” Bertrand said. Since the release of “Sunset Man” in 2008, James Otto has earned a reputation as one of country music’s finest vocalists, writers and performers. Now, with the release of “Groovy Little Summer Song,” the lead single from a yet to be named second album, he establishes himself as the genre’s chief proponent of Country Soul. “Sunset Man” debuted at number three on the Billboard Top 200 album chart, and its debut single “Just Got Started Lovin’ You” was the year’s most played single at country radio and was Billboard’s number one Hot Country Song. Opening for Otto will surely be a great experience for the band, the members of which are always trying to learn something from other songwriters and performers. To hear a sample of what Jason and the Haymakers have to offer, log on to www.jhaymakers.com. Tickets for the show, which also features Eric Paslay, are $10 and available at www.ticketweb.com. Doors open at 7 p.m. at Joe’s, 940 W. Weed St.
James’ NEW album “Shake What God Gave Ya” hit stores 9/14/10 and is available now at his Official website jamesotto.net, iTunes, and Amazon.com.